The word ESSENTIAL now takes on a new meaning. 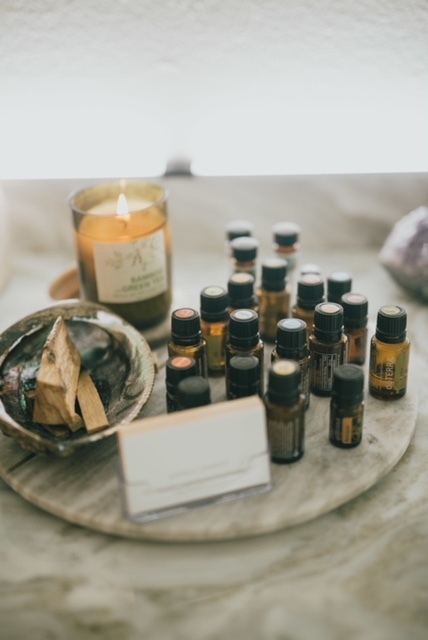 Clients have been sharing with me some of their favorite uses for essential oils making me feel like an essential oil novice. I wanted to share some of their great tips- let it be known that oils are can be used for more than relaxing your body and soothing sore muscles, fighting cold and flu symptoms, alleviating pain, improving digestion or stimulating circulation. Here are some next level tips and uses for these powerful all natural oils. Make homemade outdoor spray using essential oils. Using a 4 oz clean spray bottle, fill it with 2 ounces of distilled or boiled water. Add 1 ounce of witch hazel then about 25 drops of lemongrass and 25 drops of eucalyptus essential oil. Get yourself some wool dryer balls and say goodbye to chemical filled dryer sheets for good. Put your favorite essential oil on the dryer balls to scent your laundry. The wool dryer balls also cut your drying time by 50%. This works! I love to use Floracopeia’s Wild Lavender essential oil. Keep the bathroom fresh at all times hack. Place 1-2 drops of your favorite oil inside your toilet paper roll. Every time the roll spins you’ll release the scent. Can’t help you though when your potty training toddler spins the whole role in one sitting! Brighten your skin—and your day. Make your face shine as bright by adding rose hip and jasmine oil to your arsenal. Rosehip oil contains vitamin C and lycopene and is made to rejuvenate the skin, while jasmine is made to help skin elasticity and fade stretch marks. Domino Magazine turned us on to this one. Who knew that you can put a few drops (no more) of pure lavender oil in your mascara tube to extend its life by two to three weeks? Don’t get creative and swap out another oil in place of lavender, though. It’s your eye, so you want an incredibly gentle oil, and lavender is perfect for this because “it has natural anti-microbial and anti-bacterial properties, so it’s great for anything around the eye,” says Panton. She also recommends using lavender to fight zits: “It’s a great blemish spot treatment for sensitive skin, because of its similar properties to tea tree, but more gentle.” It’s very calming, so come bedtime, wash your face, dot the oil anywhere you want to be more astringent, and it’ll help you chill out. I’m a pushover for beautifully packaged, organic body scrubs but not a fan of paying $20+ for them. Once I found out how easy it is to make my own, I’ve been hooked. Just mix 20 drops of grapefruit (or your favorite citrus) essential oil with ½ cup brown sugar, and ½ cup coconut oil for an invigorating, fresh Mother-Earth approved scrub that smells like heaven.